Sure, you down a few beers on the weekends. But what if you were a master at it—for a living? 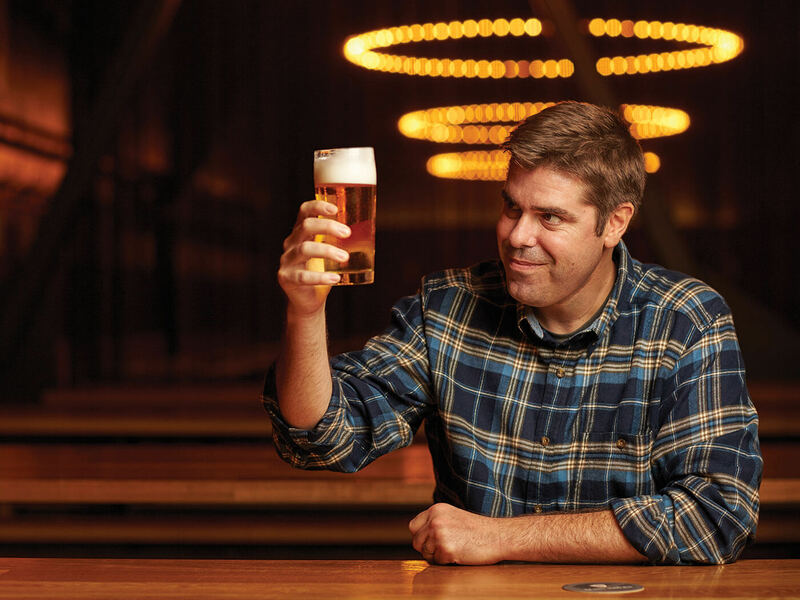 Meet master cicerone Rich Higgins, a beer consultant who specializes in pairing just the right beer with food. We visited Rich at Schroeder’s—the oldest German beer hall west of the Mississippi—in San Francisco to get a history of holiday beers and his best, host-approved picks. How’d you get into brewing beer for a living? So what did becoming a cicerone entail? And what’s it mean to be a “master” of beer? “The program really fell in my lap because it was stuff I’d been training for and studying already from a very holistic approach: beer styles, beer history, brewing, beer flavor, food and beer pairings, and draft systems—all the things I’ve been obsessed with for the past 10 years. I’m constantly studying, beer is constantly growing and diversifying—it keeps me on my toes. So how many master cicerones are there in the world? So it’s the holidays. What’s the history behind brewing a special beer for the season? “More than 150 years ago, most beers had a perfunctory function—they were a source of hydration and they kept you from drinking well water with the plague in it. Beer was something that everyone needed to drink all the time because it was the only safe beverage. It could be 2%-3% alcohol—so not everyone was walking around drunk. But if you had money, you tended to have the higher alcohol stuff as a luxury product. They’d drink the weak stuff during the day, and then at night, they’d take a few nips of the strong stuff. However, most small houses would brew a special luxury beer for the holidays to celebrate. It also helped through times of fasting. So, for example, monks would brew a strong doppelbock as a way to survive the hunger pangs—it was sweet, it was full of calories, it was full of breadiness. Back in the day, beer was something that everyone needed to drink all the time because it was the only safe beverage. Holiday beer is more about strength than the spices. Are there rules for serving holiday beers—like specific kinds of glasses or temperatures? “It depends on the beer. The warmer anything is, the more aromatic it is. So if you have a lot of alcohol in your beer, you don’t want it too warm because it’ll burn. But you also don’t want it so cold that all the flavors—like malt or spices—get shut down. So we’re talking 40-50 degrees, 55 maybe for some of the bigger beers. Are there types of food that go especially well with holiday beers? “The main thing you need to worry about is matching the intensity of beer with the food. Holiday beers tend to be higher in alcohol, but alcohol comes from malt, so they have more body, richness and sweetness—like your favorite holiday desserts, sweet potatoes and all the roast beef or turkey. They’re generally not good with appetizers and salads (but who eats that during the holidays anyway?). Beyond that, think of the color as a reflection of how the food is cooked. Roasted foods, for example, have flavors that harmonize with the flavors in a darker beer (that beer got dark because it was roasted). The main thing you need to worry about is matching the intensity of beer with the food. Is beer an acceptable host/hostess gift? What are some recommended beers to bring? Raise a glass to holiday beers, read more about Rich’s job and tell us your favorite bottles in the comments.